If a person moves alone, he/she is entitled to get half Basic Pay and if he/she moves with family then he/she is entitled to get Full Basic Pay. Family Members above 12 years of age will get full Daily Allowance and the Family Members of age less than 12 will get half Daily Allowance. 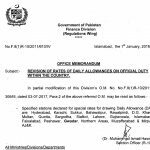 No Daily Allowance is admissible on retirement as the person is no longer a Govt Employees. Personal Car Traveling is allowed for the employees of BPS-16 & above. If he/she moves in his/her own care then just multiply distance with Rs.10 to get the total fare of traveling. Respected madam, please clarify whether a workcharge/daily wage employee can claim TADA or not? if possible kindly share notification,please. please indicate relevant rules applicable for Transfer grant, when husband and wife both are federal government officers but in different ministries. they got transfer in the same city. I could not find any specific reference on this subject in federal Government TA/DA Rules. On retirement, If someone is working on attachment in home district but actual post/vacancy is in another district...Will he get the Retirement TA? 1- What is the importance of a document "Tour Orders" in consolidation of a TA/DA Bill? Can a subordinate authority pass a tour order; "Green Signal to go ahead" who is not empowered by competent authority? Assuming, later on the competent authority sign the same TA/DA Bill? 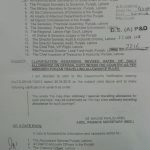 2- Is a Tour Order can be assumed as sanction of payment of TA/DA? Dear Shabbir I am not confirm but i think the daughter unmarried can be added in the list. Madam kia transfer grant k ley TA budget zarori hai. Yes, budget under head 'TA/DA' is mandatory to incur expenditure. Is transfer grant allowed when a govt. servant transferred as punishment? Dear mam. My question is that an employee of grade 15 can travel and claim the fare of Green line train?? Dear Kashif only the authorized categories are for the employees groups, if green train falls in this category then he can. i m transfer from Kahuta to Rawalpini, can i get transfer ta/da? Dear Intikhab I am not confirm. 16.093 Km and minimum duty time must be 4 hours or more. Assistant, IG Prisons Office, Karachi. Dear Khaqan Ali I am not sure. please koye b jawab do. Dear Madam i want to know that if an officer retired from his service, if he/she claims for the TA/DA on medical ground....can it be legally possible to get the said amount as a regular officer gets during his service time, and thanks. Dear Muhammad Riaz i could not understand the concept of TA DA on Medical Grounds? I need one basic pay notification, given to retired person who travels with family. can i claim ta/da for my home town where I'm also getting self hiring. Dear Sir, I am a provincial servant. I have been promoted to BPS-18 and in the same notification transferred from Peshawar to Swat. I have two members in my family, me and my wife, the distance from Peshawar to swat is 175km and we had a load of luggage round about 42000 kg, what amount will encompasses my transfer grant. I am Grade 17 and transferred from Karachi to Islamabad following is the list of my family members. what will my total transfer allowance as per rule? is he/she is entitle to claim Daewoo ticket? can you give me any reference of rule/notification according to which BS16 is entitled to travel by personal car while claiming TA/DA for official tour ? Can I Have the TA/DA Claim Form for 16 and Above Officer (Federal Employee) in soft form. Madam i want to know that if an official transfer 2 time in a month, as per office orders he is entitled for transfer TA , can he claim and take transfer TA at both office orders as per rules, please give me reply as early in detail with supporting documents in this regard please. I complete 6 months basic course training of police in Hyderabad from Karachi so I want claim for t.a/d.a please give me format of application. My question is, that if an officer of BPS-22 is travel from Peshawar to Lahore for his personnel/dependent treatment either he is entitled for TA/DA during his journey or not. I am a federal govt employee in grade 16, I came to play sports competeion in islamabad from peshawar on movement letter. My stay in islamabad was 10 days. All messing, transportation and accommodation was self arranged by myself. Am i elligible to claim my TA/DA? If yes. How? What will be approximate amount for the subject i discussed? if there is any rule that BPS-16 employees are entitled for personal car transportation allowance on permanent posting/ transfer please tell me. Dear M sohail, i m not confirm but I have heard that BPS-16 employee can use his personal car. 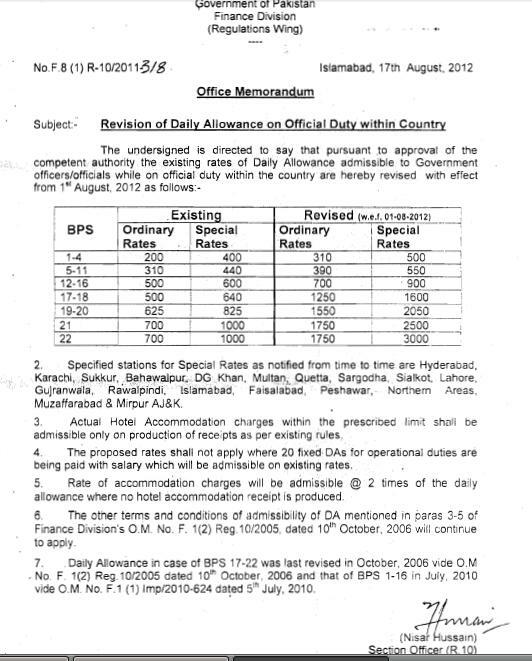 I m BPS-16 gazetted officer in federal govt deptt: recently I have been posted from karachi to peshawar. I want to ask that I m entitled car transportation allowance or not where as I will travel with my family by air/ by rail. Dear M Sohail I m not confirm, however you can try to claim the car transportation as car transportation starts from BPS-16. Thanks dear sister for your all kind of and ever coming supports and guidance in almost all the issues pertaining to government servants. I want to ask a question from you that if a person is detailed on training from Rawalpindi to Karachi for 24-9-2016 to 28-9-2016 (excluding journey period) for how many nights he will be paid 04 x DAs, 06 or 07. And whether he can claim TA/DA for inside city travelling @ car usage i.e. Rs. 10/K.M and how much he will be paid for train journey from Rwp to Karachi, whether is entitled to use A.C or what class he is entitled to. He is a BS-16 employee. Looking forward to hear from you. Once again my earnest regards. Is there any provision that personnel is not entitle for TA/DA if transfer ref on complaint basis? Dear Dami, according to my knowledge, on compalaint bases TA/DA is allowed. Please enlighten me about my problem regarding my Transfer TA/DA. I had been working in officer cadre in Federal Govt since 1990. I applied through proper channel to the Quaid i Azam University and I was selected as Asstt. Prof. I joined my duties and was fully benefited (financially) but when I applied for Transfer TA/DA I was deprived of my right. Please tell me what should I do for getting my TA/DA. An officer travelled from Nawabshah to Islamabad in two spells. 1) From Nawabshah to Lahore by Train 2) and from Lahore to Islamabad by private taxi while claiming @Rs.10/- per km. Now what the rule say whether as officer adopt such way of travelling in two spells or he should tavelled in a single spell i.e. from NAwabshah to Islamabad via Train or Road. 1) kindly tell us that is he allowed to claim two spells of travelling? 2) Nawabshah to Lahore train fare. 3) Lahore to Islamabad Private taxi. Waiting for your response please. Dear Hafiz Bashir, I am not confirm, however according to my opinion, the same journey can be in parts in some un-avoidable situations. He can claim the TA according on the basis of two spell and if they not accept the same then he may claim the same by Train the whole journey. my question is that whether a govt employee going on retirement can claim TA/DA within the same district or can he determine to settle anywhere he likes and claim TA/DA to the place of his choice or to the place of new residence. 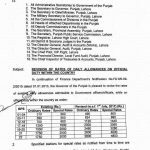 It is evident that the such an employees moves his residence from the station of his posting..
Aoa. Hope you will be feeling well. Madam please clear me this point, if a Driver go outside anywhere in Pakistan with his officer on official tour. As per TA/DA rules, May the Driver are bound to provide the Log Book copy, when he claimed his TA/DA. Secondly in which condition Log Book is required/Necessary for payment. I will be waiting for your earliest response. Dear Arbab Khan mujhay is ka confirm nain hay. I have some queries related the TA/DA and transfer grants. 1.If a person is posted from the HQ to any station for 10-20 days,due to the sick leave aur EX-Pakistan leave ,is there any restriction for not using the private vehicle and will he claim hotel charges. 2. what will the required documents to claim transfer grant. send me the answer on my email at the earliest with any reference aur details ,I will be very thankful. Dear Noman I have replied you all this in ur email. Dear Sajjad Ali Shah I m not confirm however u can study the TA/DA Rules Book/Chapter of ESTA Code for the guidance. If TA/DA paid by the NGO, then he cannot claim from Government. If i left Islamabad office at 9am and returned next day at 11pm. How much DA i should claim? i used official transport. Dear Jawad, ur DA will be only for the attendance day. 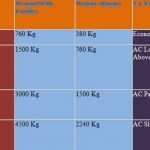 please correct the luggage charges calculation formula as (weight*distance*0.008). In sindh, the factor used for luggage formula is 0.008. If a federal government employee is working in Sindh, will he use 0.008 or 0.002 for calculation? Dear Usman Khalid, The factor 0.008 has been replaced with 0.02. I think Sindh govt has also replaced the same. Dear Hamid Ali plz once again the same question with detail. Dear Hamid Ali yeh jo balance main 700 Rupee hain yeh kisi aour kay kaam aa saktay hain. 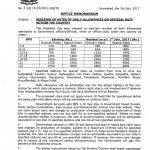 Madam, I would like to ask that if a govt servant attended a training course and his TA bill was lying pending due to lack of TA budget, and that officer is transferred in other unit with separate DDO code and Controlling officer but the department remains same and starts drawing his pay from the new unit, can he claim the outstanding bill of unit whose charge he relinquished from the amount of budget of his new unit where he is currently working ? Dear Qaisar he will surely claim the same TA/DA amount. mam when a person is entitled for a one day (daily) for example a person starts his journy at 4 AM when his time complet for a one (daily) in the same day or on next date 4 AM. And if a person travels dailay for office work for 10 to 15 km. is he entitled for TA and will he get that . Dear Allah Rakha, if the same person goes out of station, i think he is eligible for the TA/DA. 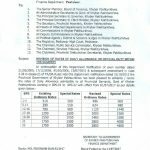 how can calculate claim for TA retirement .mera domicel karachi ka r permanent address hyderabad initial appoint hyderabad now my posting in Karachi. Dear Anwar Ali what is the address on CNIC & Service Book?